With general elections round the corner, an interim budget is a vote-on-account. If such a budget is still a talking point in contemporary India, it’s because the Narendra Modi government is the biggest advertiser in the country, with his cronies controlling media houses, paying public relations agencies enough to extract juice from a dry lemon. During Modi Sarkar’s tenure, India’s defence sector has been hit by two contradictory moves. The government has been complaining of resource crunch to defer and procrastinate over armed forces acquisition. The Army needs 6.22 lakh assault rifles, 4.43 lakh carbines, 6,000 sniper rifles and 41,000 light machine guns. The government is negotiating with Russia to produce AK103 assault rifles in India but in the meantime, it is also placing an order for 73,000 assault rifles from SIG Sauer. The Indian Air Force (IAF), thanks to the truncated acquisition of 36 Rafale fighter jets instead of 126, is struggling with depleting squadron strength. The Indian Navy needs submarines, but the deal is stuck because the Modi Sarkar has to take a call on whether Anil Ambani-owned Reliance Naval Engineering Ltd, a company which has been unable to deliver four offshore patrol vessels it was contracted to build and deliver, is qualified for bidding for the Rs 40,000 crore submarine deal. On the other side, the armed forces personnel costs have risen causing a problem for the Army, because more than 70% of its budget goes towards salary and allowances. In contrast, the IAF and the Indian Navy spend 34.5% and 27.5 % on manpower. Thus, periodic complaints of under-budgeting for defence go hand-in-hand with over 70% of the total defence budget going to meet salary, allowances and pension costs. Under Army Chief Bipin Rawat, an audacious attempt is being made to address this. The four-point plan envisages carving out an Independent Battle Group (IBG) from the existing Division of the Army. A division comprises all components (infantry, armour, artillery, engineers, signals and logistics) required to fight a war. Now, the resources would be split and make IBG equipped to operate independently. This apart, there are plans to reorganise the Army Headquarters, undertake cadre review of officers and re-evaluate manpower structures, to reduce it. However, while “re-structuring” and “reorganisation” to reduce 50,000-100,000 personnel is in the making, there is yet no clarity over the push for any concomitant increase in recruitment of personnel for short service of up to seven years, thus reducing the pension burden in the long run. As also, to keep the manpower profile young. The problem is that withdrawing post-retirement medical benefits for short service soldiers reduces the attractiveness of short-term recruitment. If a soldier gets disabled, given the propensity of the Ministry of Defence to legally contest disability benefit, it further diminishes the appeal for short- term recruits. Besides, the manpower strength of the Army comprises 1.3 million personnel. In addition, there are 2.8 million reserve troops. Thus, a much larger cutting of flab is required. One area that is not being talked about has to do with reducing the footprint of the Army’s engagement in internal security duties in “Disturbed Areas”. Against a gradual approach stretched over time, this offers a way out to reduce the Army’s flab, which can provide a major reduction in manpower over shorter period, as well as help reduce personnel cost. Fighting wars against one’s own people for decades has been critiqued by the Supreme and democratic rights and civil liberties organisations. Quite apart from demoralising civilians by targeting them and undermining constitutional democracy, this actually saps the Army of its moral high ground. If they carry out their operations, such as the current Operation All Out in Kashmir, there is no way the hinterland can remain secure. Thus, a singularly effective way of saving scarce human and material resources is available to us wherein the Government should opt for political resolution of internal conflicts rather than prolong the failed and futile policy of military suppression. Now, let us take a look at the Interim Budget proposals for the defence sector. The Interim Budget for 2019-20 earmarks Rs 4,71,847 lakh crore or 15.6 % for defence out of Modi Sarkar’s total estimated expenditure of Rs 27,842,200 crore. Accepting Stockholm International Peace Research Institute’s definition of Military Budget to include expenses incurred on account of para-military formations, a sum of Rs 1,03,927 lakh crore has been earmarked for the Ministry of Home Affairs, which has a military force of 1.2 lakh personnel at its command. So, the total Military Budget is Rs 5,34,938 lakh crore or 16%of the total expenditure for quelling conflicts. If we separate salary for armed services (including civilian employees which includes workforce of the defence and ordnance units) and add pension, we get a personnel cost of Rs 1,19,559 lakh crore and a pension bill of Rs 1,12 lakh crore, which together constitutes more than 70% of the defence services budget. This rises if we were to add the salary bill of Central Para Military Forces of Rs 70,802.16 crore which is administered by the Home Ministry. The personnel costs are hurting our collective pockets. This when One Rank One Pension is yet to be implemented in full. For asserting this demand on the streets of Delhi, ex-servicemen were lathi-charged by the Delhi Police, which operates directly under the Home Ministry. Modi Sarkar claims to have disbursed Rs 35,000 crore, which is but one-fifth of the OROP requirement. The provision of OROP is a promise made by Parliament and must be kept. If we add to this the salary bill of the Central Para Military Forces, which SIPRI qualifies as military expenditure and as 7th Pay commission noted as an overlap in their functions. If these two components are added, the military personnel cost stands at Rs 3.13 lakh crore and total military allocations stand at Rs 5.54 lakh crore or roughly 15.7% of the total expenditure of Rs 27.84 lakh crore. The Army strength has grown from 530,000 in 1947-62 and touched 13 lakh plus by 2014-18. It has six operational command or regional commands and one training command. There are 14 corps, 49 divisions and over 249 brigades. A back of the envelope estimate would show that taking allocations at their face value reveals that the cost of maintaining 1.4 million service personnel is 37% of the total defence budget and another 35% comprises defence pensions. Now, four out of 14 corps, 3 & 4 in North East and 15 and 16 corps in J&K, latter two by far the biggest in terms of manpower, no less than 30% of the personnel are deployed in “Disturbed Areas” for decades. 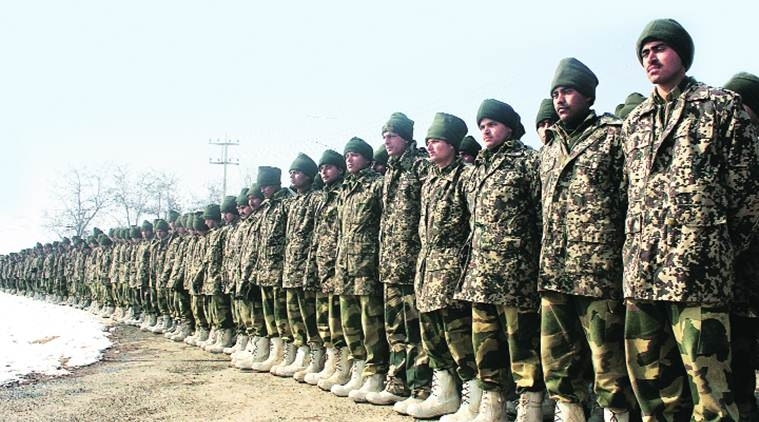 The massive rise in Army’s manpower growth is on two counts. First, says Lt General Praksh Katoch [Cutting Army Flab, Indian Defence Review, 14/05/16] that the Army raised 14th Corps as a consequence of the Kargil “limited” war and then raised a new Command, South West Command, =in response to “Operation Parakram”. Both under the BJP-led Government. And all this without the country having either a National Security Strategy or a Comprehensive Defence Review. Another spurt in recruitment was in 1992 when Rashtriya Rifles was raised as a dedicated counter- insurgency force and is 75,000-strong, for which the annual budget is over Rs 7,000 crore. Assam Rifles too plays a similar role in the North East with its nearly 45,000 personnel. This is in addition to regular army regiments involved in counter-insurgency in J&K as well as NE. It is safe to say, therefore, that 30% of the Army’s budget incurred on personnel is because of its internal security ‘duty’. This is to highlight a crucial area in need of attention which, if the Army gives any thought, could result in substantial reduction and complement and help the process of “restructuring” as well as provide resources for social welfare. It must begin with the Army going back to its primary role of defending the external borders and withdrawing from prolonged internal wars. Another way to cut costs is by cutting back on defence civilian employees whose numbers grew from 42,370 (actual) in 2017 to an estimated 88,117 in 2019. It does not make sense to urge the Army to cut flab while increasing civilian recruitment in Ministry of Defence and pushing on with 76,000 new recruits! It is argued that it’s all very well to talk of not fighting wars at home, but for sure elements of “proxy war” are present in J&K. Undeniably some foreign militants and groups such as Lashkar i Taiyyba are present in J&K, but it is an accepted fact that 191 who joined militancy in 2018 were Kashmiris. With their numbers no more than 350 militants, there is no gainsaying that most of them are locals. Even Army commanders who have served in J&K as well as a former National Security Adviser have acknowledged the indigenous nature of militancy. Nevertheless, let us accept the government’s claim for the sake of argument. Now, in NE there is no proxy war, so why should there still be “Disturbed Areas” and Army deployment? In fact, the latest available MHA annual report for 2016-17 claims not only that the “situation improved substantially” but recorded that at 308, the year 2017 “witnessed lowest number of insurgency incidents since 1997”. As for “proxy” war in J&K, if Pakistan is behind militancy there, as officially propagated, then what prevents the Indian government to reach out politically to indigenous Kashmiri separatist parties? Does not wisdom lie in neutralising the proxy war, if there is one, through a political process? Consider the Army chief proposing direct talks with Taliban. Why not with Hizbul Mujahideen then, who are local militants? Government of India has negotiated and indeed even met in third country, at the level of Prime Minister, with Naga underground leaders while war continued and brought to fruition a ceasefire (but no political closure). A political resolution promises to allow the Army to cut back on its counter-insurgency operations and reduce its footprint in NE and J&K. Concomitantly, it also demands suspending recruitment of 76,000 soldiers in central paramilitary forces, yielding dividends that can complement and accelerate other reforms being planned by the Army.